This coconut oil is not only good for you, it's good for the environment and the local growers in Papua New Guinea. The coconuts are wild harvested, with the oil hand finished on site by local community growers. Niugini Organics coconut oil is not only good for you, it's good for the environment and the local growers in Papua New Guinea. The coconuts are wild harvested, with the oil hand finished on site by local community growers, stored in reusable glass Kilner jars then cold transported to Australia by the shortest route of any other coconut oil in Australia. Read The Coconut Oil Miracle for more details on how this oil can be used on the body and in cooking to help manage issues like blood sugar levels, cholesterol levels and more. This is an excellent Product Tried other Coconut Oils,but we enjoy the flavour of this one the best Good value..We cook everything with this oil Pour extra over our eggs and bacon in the morning So good..
Rich, creamy and delicious, I use this wonderful oil for all my cooking and much of my baking needs - first class, clean and green, and helping some of the poorest people on earth! This is the best virgin coconut oil I have ever used. The consistency is great, the flavour unmatched and, whether used for frying curry ingredients or baking, it is unsurpassed. To this, add the facts that the processing is minimal, the wonderful jar is re-useable, and the purchase helps workers from one of the poorest countries on earth, I cannot recommend this product any more highly - except for the price. Well done, Shop Naturally! 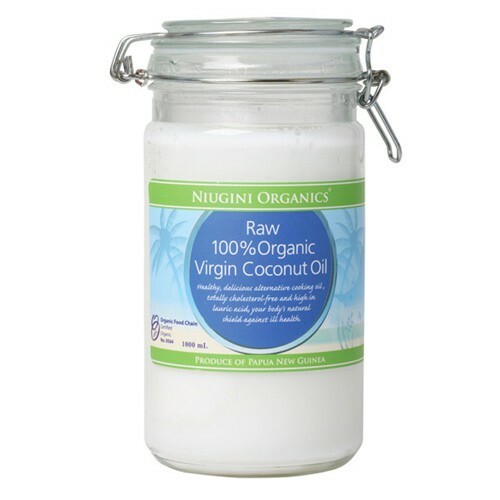 This is the first time I have used Niugini Organics Raw 100% Virgin Coconut Oil and I am loving it. Great taste and wonderful for the body as well. Love this coconut oil. Smooth - not grainy like some get. Good value. Have been buying this coconut oil for years, always smells so fresh, straight from the tropics. And the jars are easy to wash out & use them in the pantry. I received the product quickly. 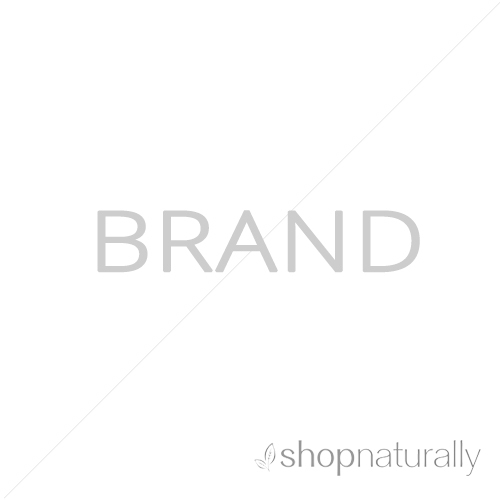 Unfortunately there was a minor problem with the product, Shop Naturally responded immediately to my concerns and replaced the product, no questions asked. Excellent service, thank you. 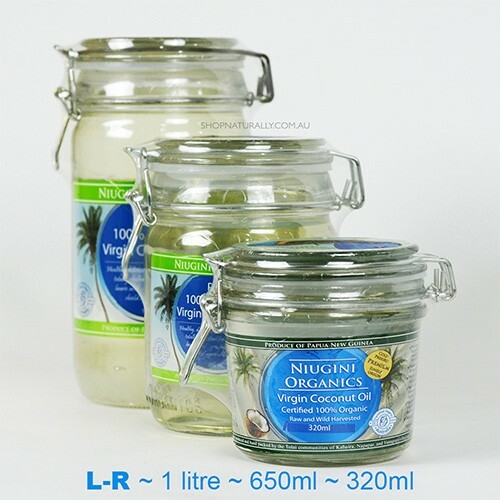 I buy the Niugini Organics Raw 100% Virgin Cocolunit Oil in the 1 litre jar because it tastes great, great value and I can use the jar for storage when finished! The best quality and tasting coconut oil. I would not use any other. Fair price. Very happy with my purchase of Niugini Organic Coconut Oil. Pleasant taste and so many uses, such as oil pulling, skin care and cooking. I even give 1tsp to my dog and now she has a super glossy coat. I have now been using the Virgin Coconut for 7 days to help my arthritis. My left knee is more painful than my right. I now have no pain in my right knee and have longer periods of time pain free in my left knee. I am hoping by continuing to use it that my left knee will be totally pain free. This product is wonderful for cooking and using as a moisturiser and facial cleanser (it gets all my eye makeup off, including waterproof). It puts a lovely glow on my skin and I feel great using it because it is 100% organic. I have tried and tested many organic products and have fallen in love with this coconut oil. Get some! (I would recommend the 1L jar because you will use it all the time and run out of it quickly). This is good stuff....and I love the container. We go through a lot of coconut oil and this is now my favourite. This is the best priced Niugini Organics Virgin Coconut oil l use it for cooking mainly and smoothies.l have tried other coconuts oils but this is the best by far and the bottles are very useful when you finish using the coconut oil. I am very pleased with this product and will definitely buy again. Great product, easy to use and delicious with most foods. Amazing coconut oil. Am a return customer. Love the jar too. Very happy with product, excellent packaging and delivery. Will absolutley order again. Its probably one of the best tasting oil I've had.I use it to cook with and take a tbsp every morning and am feeling the results i think its even helping my memory and blood pressure. Very good product would recommend it to anyone for a healthier lifestyle. Delicious Coconut Oil! and comes in an awesome reusable jar, reasonably priced compared to other retailers. Buying this way is a big upfront investment but the quality of Niugini coconut oil is really good and the jar is lovely and useful. I feel good supporting such a sustainable business, and having a lot of coconut oil on hand means I use it for cooking, for skincare, for everything! It?s a great product. Great product delivery quickly and packaged very well. My favourite coconut oil - kind to the environment, tastes great and a wonderful glass container you can reuse yourself or as presents filled with homemade treats. Love this oil, so versatile with many health benefits. First time I have tried Niugini Organic Raw 100% Virgin Coconut oil in fact first time I have tried any coconut oil for cooking so haven't really got anything to compare it with, however it tastes great and family enjoying it. A very nice, mild tasting, creamy coconut oil. Easy to get out of the jar - even in this cold weather - and not overpowering flavour in my baking. Excellent. Best I've had yet. The real deal and you can just taste the difference from other coconut oils. So happy about this purchase. First time I tried it and am not 100% happy with the taste. It has a slight bitter note to it. <EOL>Shop Naturally note - try a Coconut Magic. It has a much milder taste. This coconut oil is amazing. I have very fine and damaged hair and have used every product on the market and I use this now twice a week and my hair is finally starting to have some new lift it is also thicker then it has ever been. I also use this to put in my smoothies and use it as a cooking oil. I 100% recommend this to anyone. Super fast delivery, excellent product AAAA+++++ service. I've used this product a number of times over the years. I try other brands and keep coming back to this one. It is far superior than the others I can just tell it's the real thing. It feels smoother on my skin and tastes Better than other brands I've tried. Great value. Smooth and delicious. Great product and fabulous reusable jar. Have repurchased this before. Great taste not overpowering. Love using for frying. My favourite coconut oil! Super fast, reliable delivery from Shop Naturally. Love this coconut oil. Use it for heaps of things as well as cooking! Also as an added bonus I recycle the jars, they're a great size! This is a great product. I love the reusable clip jar and buying the larger size makes it great value for money. I use the oil for cooking, skin care and as a hair moisturiser. Very happy with the reusable jar. And the oil is great quality. Just two weeks ago, I decided to try adding coconut oil to my diet/regimen because of all its health benefits, and settled on this particular brand after much research. I have to say, it is amazing so far! <EOL>I have also found that I have tons of energy in the evening until I decide to go to bed, and consistently wake very refreshed. I don't have a midafternoon slump like I used to, and I largely attribute that to the addition of healthy fats, like coconut oil, and near elimination of sweets and bread in my diet.I wish I had made these changes sooner!! <EOL> <EOL>I've also been using it as a light facial moisturizer after showers, and it's been great for that. I feel much better knowing what I'm putting on my face. The oil is also a great hair serum! I use a tiny bit (just enough to barely coat the very tip of your finger) spread in my palms, then rub through the middle/ends of my almost dry hair, then roll it in a bun for about 10-20 minutes. When I unroll it, my hair is wavy and smooth, silky and strong. Love it. <EOL> <EOL>Coconut oil has been a great addition to my life, and I've been so excited about the changes in my energy and sleep in the last couple weeks.I definitely recommend this product. <EOL>Happy Eating!!! Continue to love this oil, i will never buy any other! Absolute pleasure to deal with you. <EOL>All care and attention given to packaging, fast shipping. Highly recommended to others. <EOL>Thank you! Shopping was so easy on your site, the price was right and the delivery was within a couple of days. Excellent customer service. Will purchase more coconut oil on this site in future. I've done the research & Shop Naturally has the best price in NSW for this divine coconut oil. With out a doubt Niugini is the best coconut oil available. Its quite soft & delicate plus not too strong in flavour. A,good coconut oil, with the added bonus of the good sized reusable jar. Might have to wait until cooler weather before ordering again though, as Aust Post failed to follow package instructions to keep the parcel upright, so I experienced leakage despite the excellent shipping packaging. This is a beautiful product, and adds a lovely hint of coconut fragrance to any cooking. I love that it comes in a lovely glass jar, not plastic! And is grown sustainably. My favourite coconut oil. Best one around. I use it on my skin, oil pulling, cooking - everything. It's yummy, good for you and a jar to boot! This product is excellent and the fast delivery of the order is great <EOL>I will definately order again when I run low as this is my favorite product to buy. Love it - great price and can use it for everything! l love this product, the taste for when I am cooking, the texture for when I am using it as a moisturiser. A multipurpose item. Beautiful jars of coconut oil, best value that I've found so far. Keeps solid in cooler temps and liquifies in the summer. Great flavour, I use it in everything, I mean everything! Also perfect for oil pulling and using as a moisturiser! Love this product! Fantastic coconut oil with beautiful taste. Glass containers are great and reusable and the product has low air miles so it's very environmentally sound. Love it!!! Practically tasteless when you mix it with your protein shake! This is my favourite coconut oil. We use so much it is great to have the larger jars. Nice wide opening for when it's hardened in cooler months too. Use it for cooking & baking. Coconut biscuits YUM! The perfect coconut oil for body, cooking and baking too. The price is perfect and after use you've got a big glass jar for free. This is my favourite coconut oils - great tasting and the jar is fantastic to use as a kitchen storage jar (ie. for nuts, flours etc) once you eat all the coconut oil. Really nice product, using it mainly for my skin as I am pregnant. It smells beautiful and moisturiser a my skin really well. Love it. I love the purity of the Niugini Coconut oil and it has the BEST taste of any that I've tried. Great oil. Love the re-usable jar too. Lovely oil to cook with and use in desserts and sweets. Very clean and fresh tasting. I started with Coconut Oil for my diet, great improvement, <EOL> Now add Oil Pulling for my teeth <EOL>Good results with this oil. Delicious coconut oil and a fantastic jar to re-use. I LOVE this brand coconut oil. I use it for everything. And the glass jar is so efficient. Delicious organic coconut oil, wild harvested and a storage jar as a bonus. What more could I want? Great coconut oil and a fantastic jar to reuse once all the oil is used. Great to sweet treats and skin care! I LOVE this coconut oil. By far my favourite brand! I've been using it for a couple of years for everything from hair masks to WD40 and it lasts ages in these awesome big jars. Another bonus is I have beautiful glass jars to use for something else once the coconut oil is used up!